AffordableDJsLasVegas.com; The most trusted, reliable, energetic, referred and requested Vegas DJ's & Live Entertainment company serving Las Vegas and surrounding areas since 1998. The USCA "Best of Local Business" Award Program recognizes outstanding local businesses throughout the country. Each year, the USCA identifies companies that we believe have achieved exceptional marketing success in their local community and business category. These are local companies that enhance the positive image of small business through service to their customers and community. The most trusted, reliable, energetic, referred and requested DJ entertainment company serving Las Vegas, Summerlin, Henderson, Lake Las Vegas and surrounding areas in Boulder City and Laughlin. Thanks for a great night. We'll see you in another 25 years at our 50th wedding anniversary. Mo was blown away when Marilyn made her surprise celebrity guest appearance and sang one of his favorite songs. Our friends are all still talking about it! Mo wants to know if you're available to DJ and entertain all of us again at our daughters graduation party...can you get the Lady Gaga Impersonator to make a special guest appearance? Thanks for a great party! Getting fifty 13-year-olds focused and having a terrific time is not an easy feat! A knife-wielding DJ! Boy can you spin great tunes and get the crowd going. If there were a place that played the songs you played that I could go to, I would go out every night. Thank you for helping make my Sweet 16 a great success. I'll never forget it. Rocky, we'll always be grateful for the great lengths you went through to make sure everything went so well. Thank you so much for a wonderful party. You're also a great wedding planner. Affordable DJs Las Vegas gave us good advice on many issues. Thank you for being personal and attentive. 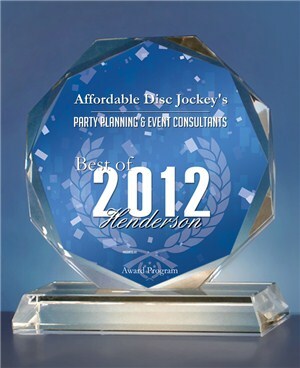 AffordableDJsLasVegas.com A fully mobile Vegas Disc Jockey entertainment company. We can accommodate your special event or corporate function at any location; creating unforgettably fun celebrations, corporate functions and social events since 1998. Below are just some of the many Hotels and Country Clubs that we've had the honor to work at. Call 702-743-6833 or contact us today for a FREE consultation!